Do you want to know what hurts my heart more than almost anything? It’s really a simple answer. I hate when a mom has a desperate desire to stay home with her children but circumstances make it a no go. Whether the reason is financial, emotional, or a spouse who won’t agree this mom is left feeling trapped going to work. I want to say something now before I get a million e-mails, this is not referring to the moms who love to work. I am not judging that at all. However, for a mom who doesn’t want to work, it really can feel like a trap. Are you that mom? Do you want to be a stay at home mom? 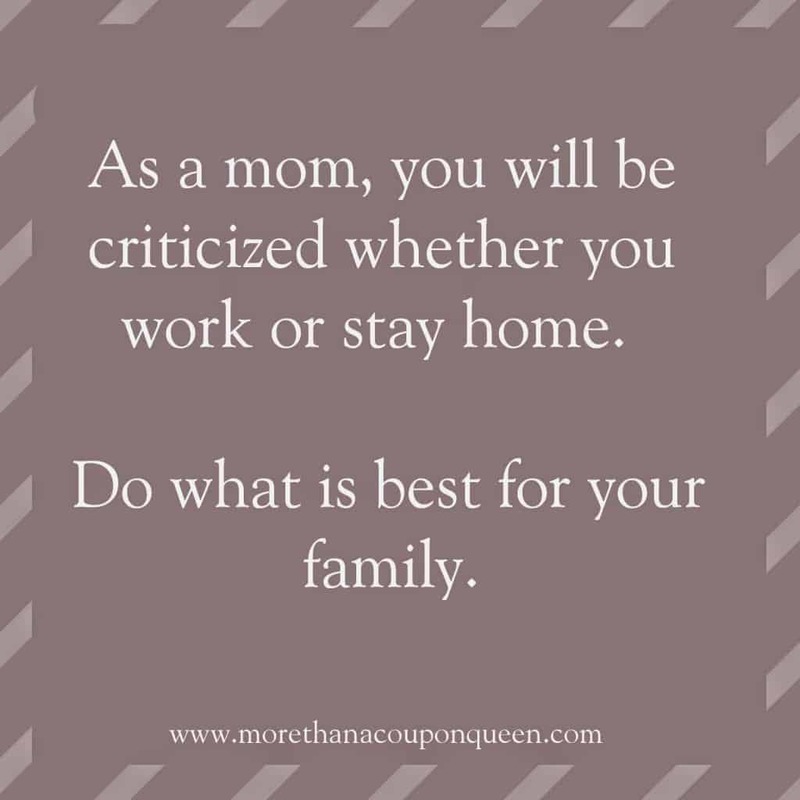 Today I am going to look at some of the reasons moms give me for working when they don’t want to and see what we can do to help you achieve your goal. This has to be the biggest reason I hear for not staying home. While this reason is very reasonable for many people it is not always the truth. I want you to try an experiment for me. Add up how much you would spend for gas, childcare, work clothes/shoes, lunches for work, lunches for your child at daycare, and the added wear and tear on your vehicle. Now add up exactly how much your after-tax income would be. Now subtract the costs of working from your income. How much money is left? Is that amount worth going to work for? Now take out your budget and list out the necessities for the month. (Not the extras. List those things you think are necessary for you to run a household.) Based on this number can you make it without your income? Not enough? Is there anything on that budget that looks like a need but isn’t? Do you need cable or can you cut the cable? Do you need two vehicles or can you drive your spouse to work some days? Do you need to eat out or can you meal plan? Sometimes looking at where you can cut costs can make all the difference. If you still can’t survive after doing these things, could you work part-time? Maybe you can’t be a full-time stay at home mom right now but maybe with some of the money-saving strategies, you could decrease to a part-time job. If you are waiting for me to tell you to do it anyway, I won’t. I will say this, talk to your spouse about it. Find out what concerns they have. You may find that your spouse shares some of your concerns and you two can work through it together. My Family and Friends will judge me. I am going to say this as politely as I can muster, SO WHAT. At the end of the day, does it matter what everyone else thinks? You are the mom that child needs. If you are feeling called to stay home with your child trust that and ignore the criticism. I hate to break it to you, you will be criticized if you work too. This is the biggest myth sold to moms who work and moms who stay home. Do you know why? You were made to be that child’s mother! No one else can mother the child you have better than you. That doesn’t mean that if you have to work, you are doing a disservice so I want working moms to know they are not less if they don’t stay home. Instead, I am saying that you do have the tools you need to be the mom your kids need. My only suggestion, plug in with moms in your area. Don’t ever do this mom thing alone. Being a stay at home mom can be incredibly difficult if you are all alone. Have people in your corner who will encourage you and cheer you on. This is really good information, I will be back. Please check out my blog and leave a comment. This is very inspiring for moms that want to be at home. Meagan…You offer good encouragement for any mama that's not sure about being a stay at home mom. Thank you for sharing at Monday's Musings. Blessings to you.